Believe it or not, there are many excellent drought plants out there, that are highly attractive to pollinators. Initially, many people who find themselves with a dry or drought garden, may believe their options will be limited and their gardens will be dull. However, drought landscapes and gardens do not have to be boring – they can even be truly inspiring and striking. If nature has created certain conditions, then you'll find there are species that will thrive in those conditions. "Nature abhors a vacuum" as they say! By combining different textures, forms and colours, the effect created can be visually stunning. Herbs, wildflowers and succulents especially, provide great options for gardeners wanting to attract bees to dry areas. In general, if you have a dry garden, try to find plants that naturally thrive in drought conditions. I have found it's far better to work with nature than against her, and much easier to select plants that thrive happily in such situations, rather than trying to water your plants every day! Succulents, such as sedums and sempervivums are great drought resistant plants. They are able to store water in their fleshy leaves and stems. Their compact heads ooze nectar during the late summer, and are loved by bees and other pollinating insects. Above: Bumblebee foraging on sedum. 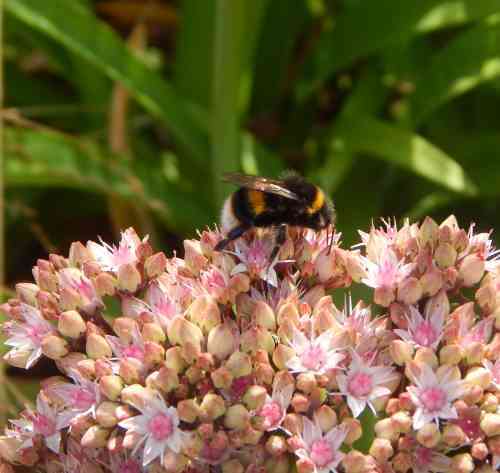 Some sedums can provide useful early autumn food for bees when other flowers are fading. A variety of bee species enjoy foraging on the flowers. Lavender – lavender thrives in gritty, dry soils, and will buzz with bees in the summer. Origanum, (Marjoram) – the culinary oregano can be enjoyed by both you and the bees! Sage – both culinary and wild sages are not only good drought plants, they are also good bee plants too. Thyme – low-growing thyme can also be grown on a green roof – although it may then be difficult for you to harvest some of it! Rosemary – will provide valuable food for bees early in the year when other foraging opportunities are scarce. I have a further page about herbs for bees here. Many wildflowers are well adapted to tolerate dry conditions, and thrive on low-nutrient soils. I have a further page about planting wildflowers for bees here, as well as some ideas for lawns. 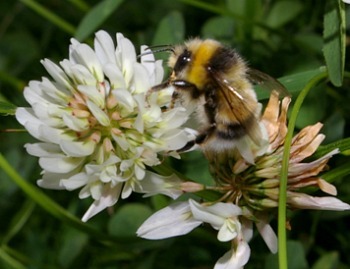 Local councils can help by creating a nectar corridor along highways - more ideas on this page. Above: Beach aster is also a useful plant for coastal, sandy areas. It provides good ground cover, and is easily divided and propogated further. 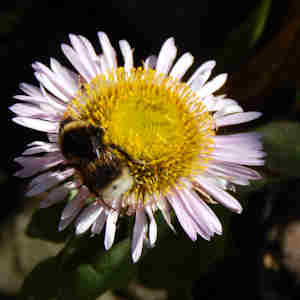 It is enjoyed by a variety of bees, and is a good plant to share with friends and family. One of the easiest ways to deal with a lawn in drought conditions, is to allow clover to flourish. It will keep your lawn looking green, and bees love it! Red clover is especially favoured, but I find white clover springs up naturally on mine. Later, after mowing, the clover makes an excellent nutritious compost for other plants. Alternatively, again, why not cover your lawn area with low growing thyme plants? 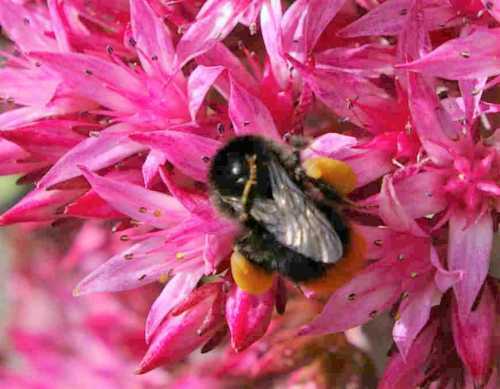 Want more information about plants that attract bees, and how to attract bees into your garden? Check out these links! Here you'll find more lists of plants to attract bees, with a seasonal guide, including garden plants, wildflowers, herbs, trees, shrubs and even fruit and vegetables. Discover more plants for bees that can survive in problem places, including shade and clay soil. Create a bee garden and save some money! Some handy tips. Check out these handy tips for creating a bee garden! How do plants attract their perfect pollinators? Discover the different ways in which plants are able to encourage their perfect pollinators to pay them a visit! Here are 10 simple tips to help you play your role in saving our bees. Together we make a difference, so why not share these tips with your friends and family?